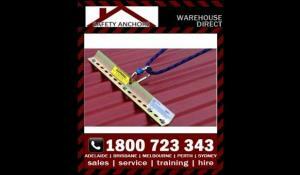 Get the Ballantyne Anchor Claw Tether Plate 500mm temporary reusable roof anchor delivered. Save on Roof Safety equipment with our low prices. This tether place is designed and tested to 15kn and therefore is rated as a single person fall arrest tether plate under AS/NZS 1891.4. While this tether place has been designed to attain a fall arrest rating, this device should always be used with a travel restraint technique. The Tether Plate is Travel Restraint and Fall Arrest device on metal clad roofs. It can be used as a standalone diversionary roof anchor or it can be used in conjunction with the T Bar roof anchor. This device gives the operator the advantage of a 360° working area on the roof surface with continuous Travel Restraint protection. The tether plate is a diversionary anchor point used for travel restrain application. It can be used on metal clad roofs fixing directly to the metal surface with a minimum of 3 AS/NZ1891.4 recommended roof screws. It can also be used on trimdeck roofs.